Press Project → Import on the main form to open the sub menu as seen in the screenshot. 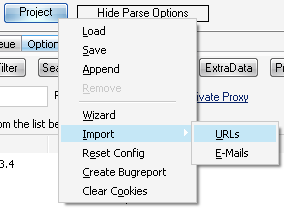 You can import a list of URLs that will get parsed the same way as the one you enter in the field Use URL as Start. That import file must be a simple text file with one URL at a line. Also make sure the URL starts with http:// or https://. An other option to get emails into the program is the Project → Import button. You can choose almost any document (e.g. *.html *.txt or even binary formats) and the program will try to search for emails in it and add it to the list.